"It's not that bad," said Joe. I was having an email exchange with refractorphile Joe D in Florida. He'd recently come into possession of a Takahashi FS102 and was looking to sell it. The catch? Some previous owner had painted the entire tube blue. He assured me that the optics were excellent. I agreed from the photos that it looked like a decent paint job, and sent the money to him. My first impression? It's not that bad. And the optics, like Joe said, were superb as usual with these 1990s vintage Taks. I set it up in my living room and promised myself that I would not attempt to touch the cosmetics. The scope was blue; it would stay blue. But you know how it is. As time wore on, I began to wonder if I should attempt to restore it to its original condition. Inspecting the tube, I saw several problem areas. The main issue is that whoever painted the tube painted the entire tube. Thus, all the little pieces of hardware, the tiny set screws, and the green part of the lens cell, were all painted over. It's not that bad...or is it?? Thus, I set out to restore the tube. Little did I know what I was in for. All the pieces had to be separated. So the focuser had the be unscrewed from the back, the dew shield would have to come off the front, and -most significantly- the lens cell would have to be unscrewed from the front of the tube. None of these would prove to be easy, as everything was painted over. As you can see from the photo above, the focuser came off fairly easily. The toughest part was finding a screwdriver tiny enough to fit the set screw without stripping it. I managed to coax the dew shield off, after carefully scoring the edges with a knife. I took the tube over to my friend Pat A's house, and with me and his son grabbing the OTA, Pat managed to crank the dew shield loose after several minutes of sweat-dripping, muscle-trembling effort. It came loose with a -crack- and he almost fell over. Now, it was on to the hardest part of all - unscrewing the lens cell. The set screw was painted over and would not budge. Not one bit. It was clear from the beginning that this was going to be a big problem. Not only was the tiny set screw covered with gobs of paint, but the entire joint was painted over. It would have to be scored without damaging the tube, and even then, who knows how much paint had gotten under the threads? Club member Gardner G decided to take a crack at it. We were at his house all afternoon, as he poured paint thinner around the circumference of the lens cell. The set screw was toast after one or two efforts, so he decided to simply drill it out. This is a challenge also; you want to drill out the screw without going so deep that you damage the aluminum tube. After he drilled out the screw and poured who-knows-how-much paint thinner around the joint, the lens cell would theoretically simply unscrew. No matter how much we torqued on the lens cell, it would not budge. The next day, I went to the hardware store and bought two sets of strap wrenches (the rubber ones that plumbers use.) I took the scope back to Pat A's house (he lives closer than Gardner) and we systematically broke the strap wrenches. Then Pat had an idea. He knew of a stronger kind of strap wrench, that used a sandpaper-like serpentine belt instead of a rubber strap. We found one, later that morning. With three of us alternately holding down the tube and taking turns cranking on the strap wrench, the lens cell freed itself with such a loud CRACK that I thought we'd broken the lens. It was that loud. We hurredly rushed over to the front of the tube to check that the lens was OK. Verifying that we had not broken the lens in two, we jumped and high-fived each other. Success! With the pieces apart, I took the tube to an auto body shop to have it painted. This took a frustrating amount of time. Auto body shops want to paint cars, they couldn't care less about some guy with a tube. Still, about a month, and $172 later, the tube, now painted regulation Corvette-White, was ready for the parts. In the meantime, I had bought another FS102 tube, but it turns out the only tubes that Takahashi will supply Texas Nautical Repair are the new NSV versions, which are about 2" shorter than the old non-NSV versions. This is not a huge deal - you just wind up using more extension tubes out the back, and only under certain circumstances. But since I now had the original tube painted the correct color, I decided to stay with the old tube. The only remaining issue was the blue lens cell. Looking it over, we decided that it was too much risk and trouble to try and paint this little piece of cast iron. And besides, some Takahashis do have blue lens cells, so the color did not look out of place. 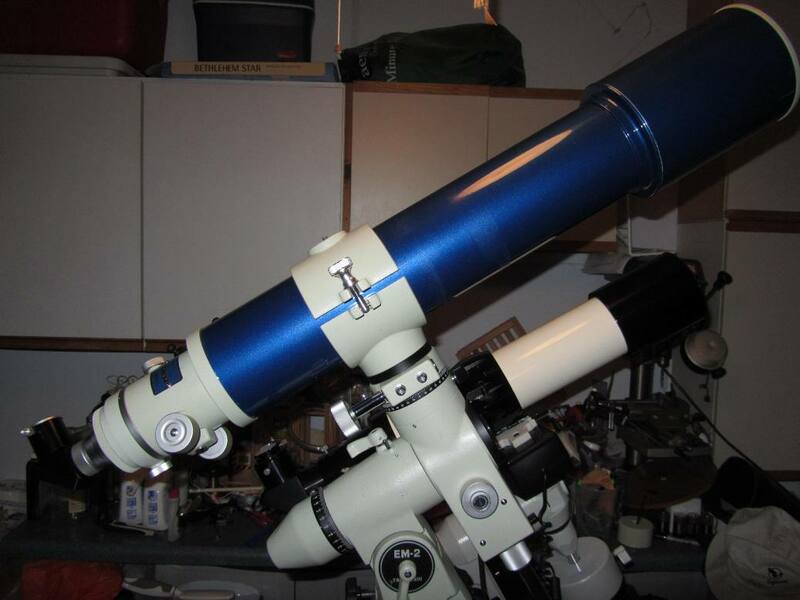 The parts went together perfectly, and the scope even retained its collimation through the process. The last piece was the decal for the dew shield. It just so happens that I was in Houston for business during this time, and when I told the people at Texas Nautical my story, they gave me the decal free of charge! The scope, no longer blue! I did have someone point out one error I made. The decals on these Takahashis are on the LEFT side, not the right. Oh well. I'm not going to try and fix it. How does the scope perform? Like all Takahashis, the optics are superb. It's hard to describe this in writing. 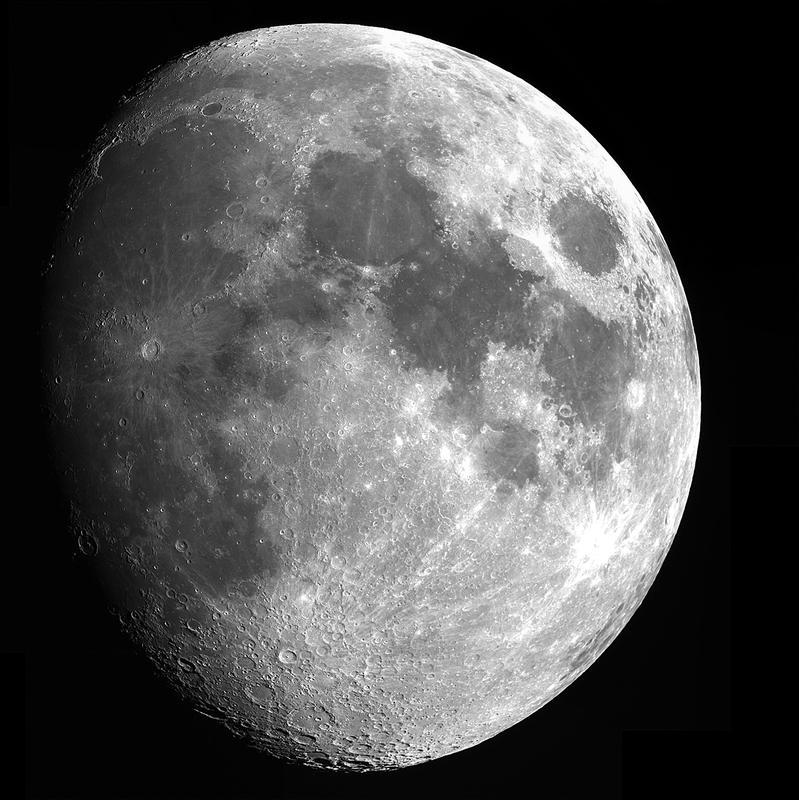 Still, I'll show you a couple of lunar stitch images I took in November of 2013. 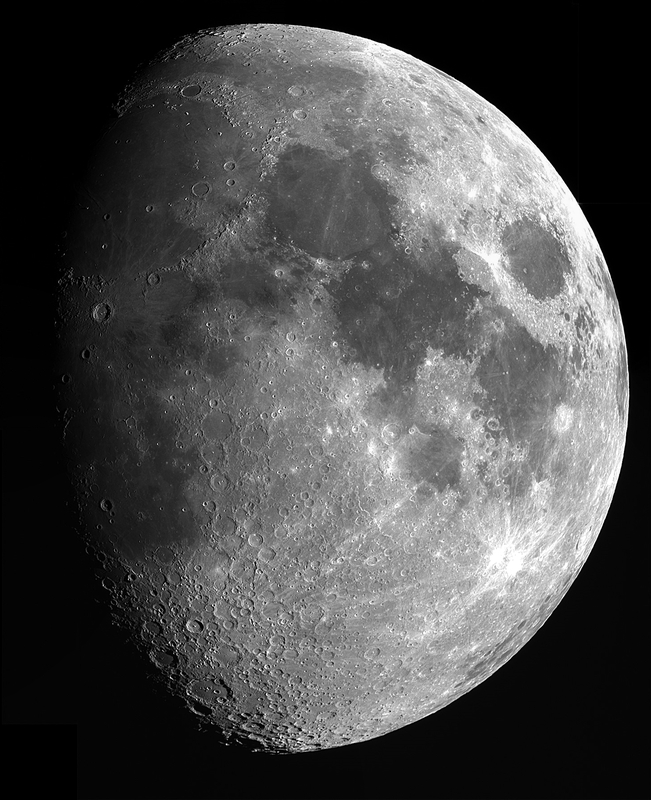 FS102 @ prime focus, DMK41 camera, Registax, Microsoft Image Composite Editor. How good are these lunar images? I took the files to Wal-Mart in November 2013, and the clerk behind the counter refused to print them! She said no one could take pictures of this resolution and that I must have stolen them. No amount of pleading from me would convince her. Finally she called the store manager over. They made me sign a release form, and took my ID and driver's license information. So I guess if I ever decide to sue myself, I'm covered! I was irritated when this happened, but in retrospect, I should have been complimented.